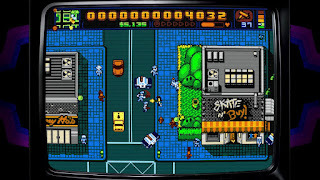 As one who enjoys retro gaming, I have been following and anticipating Retro City Rampage for quite some time. It was then to my great fortune that the game was recently made available for free via PSN+. This gave me another great game to try out on my newly acquired PlayStation Vita. 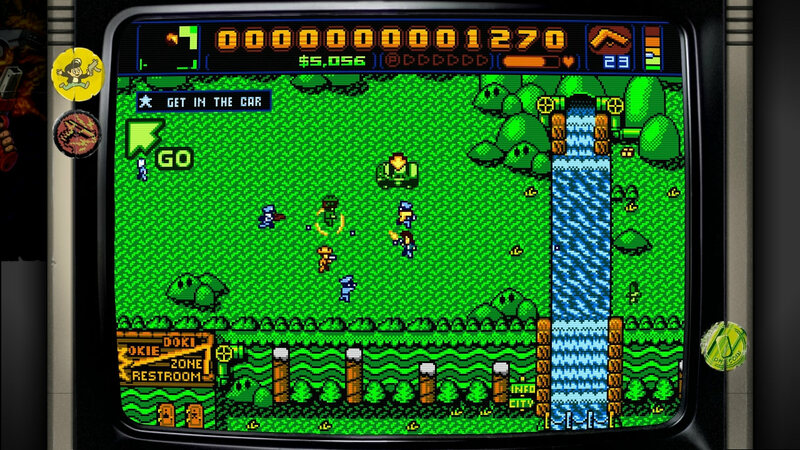 As you start up the game, you will be hit by your first wave of nostalgia with some NES-style music and sound effects. The tunes sound authentic as if they were ripped out of some anonymous NES title. 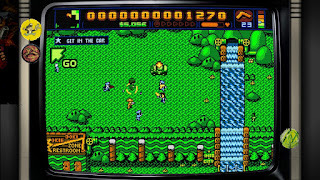 At the main menu screen, players are met with three gameplay choices and some other options below. The game modes are Story, Arcade Challenges, and Free Roam. These impressions are focused solely on the story mode. Jumping into the story mode, the game is primarily seen in a top-down overhead view. The graphics are fairly detailed and look like a clean and higher-res 8-bit action game. The main character is named 'Player' and works as a henchman for a villainous criminal named the Jester. The Jester is basically the Joker from the Dark Knight mixed with Side Show Bob from the Simpsons. The gameplay takes a page straight out of the original GTA titles. The city and game world are basically a free roaming sandbox environment. You can travel on foot or in a vehicle, and there are a wide variety of combat options from melee to guns to explosives. Just as in GTA, you have a police attention meter when you are witnessed committing crimes. You gain the most police attention by running over an officer on the street or unsuspectingly running into a police cruiser. It is debatable how much the police presence in the game enhances the game experience. likely be better served by zooming out the camera a bit during the driving sequences. Another important mechanic is jumping and stomping enemies. In the tutorial, the use of jumping to avoid attacks and jumping and stomping on enemies is strongly encouraged to be successful. The jumping and stomping works similarly to the New Super Mario Bros games. You hit the jump button, which you can control the length and direction of the jump, and while above an enemies head, you hit another button that will quickly have you stomp down upon the enemy's head. While seemingly a rewarding game mechanic that borrows from popular platformers, I do not really enjoy jumping and stomping on enemies. It isn't difficult so much as it is annoying due to its clunky execution. While trying this technique, I typically die or get hurt much worse than if I would have just mowed down the enemies with gun fire. Perhaps with more practice this won't be much of an issue, but so far it isn't fun or fluid. 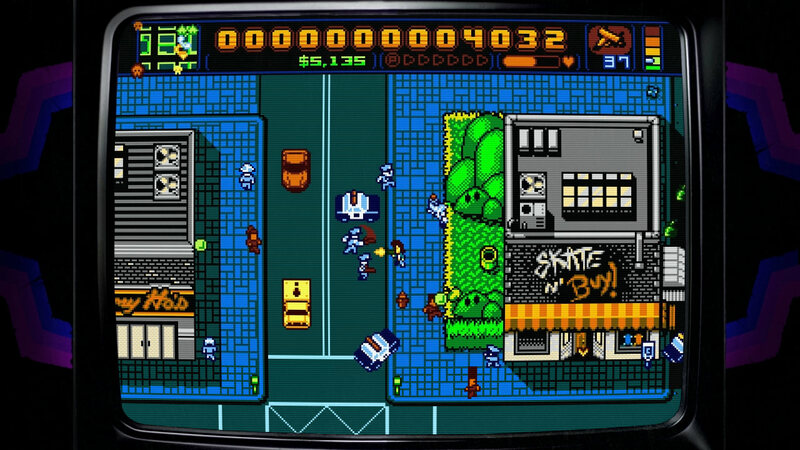 Retro City Rampage starts off in present day and has you working with the Jester on a bank heist. You are subject to some driving challenges and there are several animated scenes. This intro serves to set up the story and premise while also acting as a tutorial. During the getaway, the game briefly shows off some side scrolling platforming in a Ninja Turtles-style sewer. This acts as a preview of other game modes like 2-D platforming. The intro also exposes the player to quite a few Easter Eggs and gaming and pop-culture references. Almost every character, sound effect, environment, and dialog text is some sort of reference. Like the aforementioned Dark Knight and TMNT, the intro itself is packed with references such as Mortal Kombat, Super Mario, Back to the Future, and Duck Hunt. I imagine for about every reference I catch there is an equal amount or more that I don't even notice. These references range from being clever to absurdly forced, but enhance the game experience overall. I often find myself just looking for Easter Eggs in every scene. After the heist goes wrong, you stumble across a time machine and go back to the 80s. Here, players meet the Doc from Back to the Future which sets up the format for the rest of the game. The time machine is broken, and you have to help the Doc fix the time machine to get back to present day. You also have the option to do various side quests around town. Many of the quests in the game seem to be the standard fetch quests or assassination quests, but there are a few wrinkles thrown in to keep it a bit fresher. One side quest has you steal a TV, but while holding the TV you cannot fight. You sneak into some poor guy's house, steal his TV and dodge his bullets as he tries to kill you as you attempt to bring the TV back to the target. You are also subjected to a dream sequence early on which has an invincible player causing as much mayhem as possible with a rocket launcher. If you destroy enough in the allotted time, you are then transformed into a tank where you again try to cause as much destruction as possible before you wake up. The first main quest gets in you in touch with a Major Lee who is a major reference to Metal Gear. For some reason, the developer felt the need to toss in another tutorial here. Lee teaches you how to shoot and kill enemies all over again, but also teaches advanced tricks like jumping over cars and the jump and stomp technique. 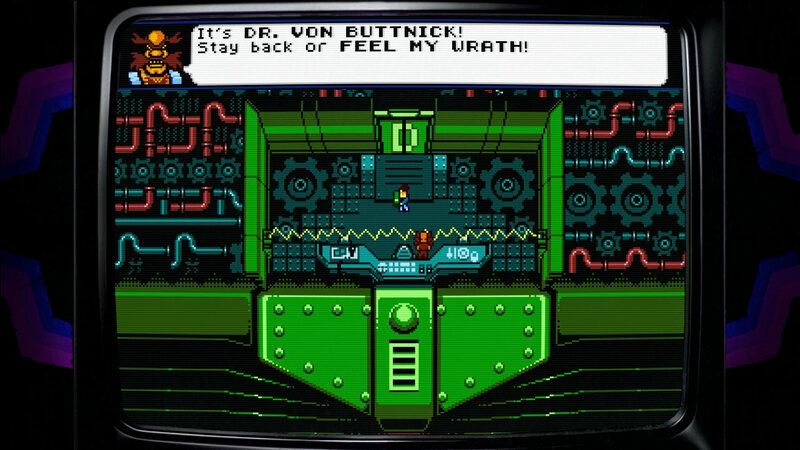 It is worth noting the inclusion of such an involved and forced tutorial in Retro City Rampage. A common complaint many old-school gaming purists have about new games is the forced hand-holding tutorials that modern games subject their player base to. 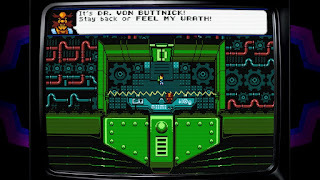 With a retro-focused game such as this, the developers are risking the ire of their target audience by including this. To be fair, as a digital only title with no physical manual, it's a decent way to teach new players. However, making these tutorials optional may have been a better approach. 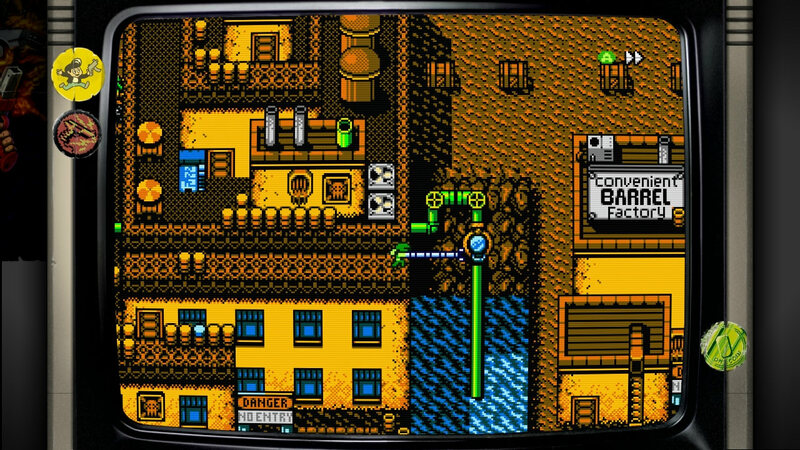 Retro City Rampage can be summed up by labeling it as an overhead GTA clone packed full with humor and retro gaming and pop culture references. I am enjoying the game for the most part with the exception of some of the mechanics and the overly long tutorial. One could make a case that the amount of Easter Eggs and references alone would make playing the game worthwhile and enjoyable. The game is available on multiple platforms, but I have only played it on the Vita. I think a handheld is the ideal platform for the game as it is a great time burner that you can pick up and put down with ease. I do struggle with longer gaming sessions as I can get a bit bored with it after a time, but soon want to pick it back up to run a few more missions. 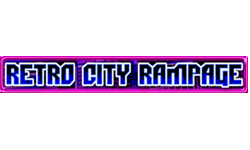 Regardless, Retro City Rampage is great for those wanting a fun romp in nostalgia as it offers a healthy amount of content at a budget price. I have been playing this on and off since it was released on PS+, and I have been enjoying it quite a bit, too. As you said, it works well as a handheld title for quick and easy gaming sessions. I love catching all of the random 80s and 90s references that seem to pop up every minute.